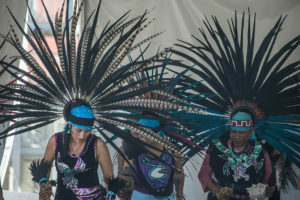 The White Hawk Aztec dancers were two of the 18 diverse groups that performed at the World Arts Festival. By Yin Wu. Pedestrians strolling along River Street last Saturday paused as they reached the manicured stretch of sidewalk in front of the Tannery Arts Center. Throughout the afternoon, the courtyard in front of the Colligan Theater welcomed world dancers from Santa Cruz and surrounding areas to perform, filling the space with dances and sounds from Bali, Serbia, India and beyond. The Tannery hosted the 2016 Santa Cruz World Arts Festival, providing audiences and lucky passersby with free performances. “The World Arts Festival is an annual festival we do to bring together all the incredible world artists that live here in Santa Cruz and the Bay Area that really exhibits the cultural richness and diversity of people in Santa Cruz,” said executive director of the Tannery World Dance and Cultural Center (TWDCC) Cat Willis. The Tannery Arts Center is a campus-like collection of renovated and newly constructed buildings created specifically for artists. The center’s weekend-long festival included a full day of performances on Saturday, a ticketed performance at the Colligan Theater that evening and a day of free world dance classes on Sunday. The Tannery supports diversity not only through events like TWDCC’s World Arts Festival but also by providing spaces for artists to work, live and to exhibit and sell their works. It contains 100 units of housing, 28 artist studio spaces and a theater. As one of Santa Cruz’s few designated low-income housing areas, the Tannery Lofts and their corresponding waitlists are at full capacity. Among the 18 scheduled dance performances Saturday afternoon was the UC Santa Cruz Bollywood dance troupe, UCSC Kahaani. Co-captain Sumana Krishnakumar said their dances are hybrids of traditional Indian and contemporary styles to reflect the group members’ Indian American identities and introduce Bollywood dance to new audiences in a relatable manner. “Every year, as we perform more and more, people are becoming more aware of who we are and what we try to present to the community,” said the other co-captain Nagashree Setlur. Setlur said when she was a freshman at UCSC no one had any idea what Bollywood dance was, but now in her fourth year, she said Bollywood has gained popularity, and now she is frequently asked about it. Stella Adelman, a dancer and company manager with Arenas Dance Company, said it is significant to acknowledge world dance in its own dedicated space. “I really appreciate the fact this festival has given the chance for a really mixed group of people to share their artistic voice, vision and culture and to say we value people no matter what artistic background they’re from,” Adelman said. Adelman studied and lived in Cuba and said for a long time people’s ideas of Cuba were incomplete and limited to exoticism or politics, but also said things are changing rapidly as a result of the U.S.’s renewed relationship with the nation. Along with its reputation as an artistic and creative hub, the Tannery Arts Center also helps mediate housing insecurity for low-income artists and community members. According to the center’s website, artists often have difficulty in finding spaces both affordable and accommodating to their unique work needs. Tannery Lofts house those who earn less than the surrounding area’s median income. “Creating artwork, it’s a life’s work. It’s not something you do on the side,” said TWDCC Executive Director Cat Willis.